An anti-NHS reforms campaign has been launched in outdoor media across the UK this week, after campaign group 38 Degrees secured £300,000 from its members to create and run the ads. 38 Degrees said that more than 20,000 of its members have donated money towards the creation and running of the ads. The ads, created by Other, are displayed on 130 outdoor sites across the UK, with consumers encouraged to request free posters and leaflets to help distribute the ads themselves. Media planning and buying is handled by Smithfield. 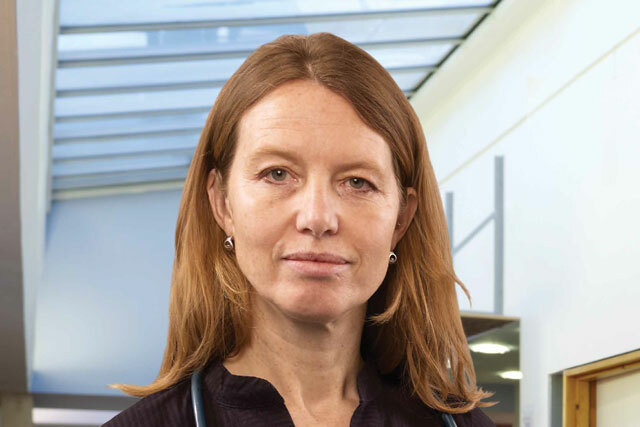 The outdoor ad shows an NHS doctor, Brigid Sheppard, standing in a waiting room, with a message written next to her that reads: "Dear Mr Cameron, you’re making a big mistake with the NHS. Please, please listen to us." A banner of text at the bottom of the ad reads: "66% of NHS staff think that if Government plans go ahead they will make the NHS worse." The campaign has been made as part of 38 Degrees’ campaign to stop the coalition Government’s proposed reforms to the NHS, and also targets Conservative voters in the run-up to the London Mayoral elections, held in May. Creative director Alex Fea worked on the ad with art director Ilinca Dumitrescu, account director Sam Savigear, head of copy Philip Croft and senior writer Hannah Brown. David Babbs, executive director, 38 Degrees, said: "38 Degrees members voted to use billboard advertising as a new step in our Save the NHS campaign. Everyone trusts their GP to give them the right advice – so hundreds of 38 Degrees members have chipped in to give a voice to NHS staff who do not feel they can trust David Cameron's dangerous plans for the NHS. 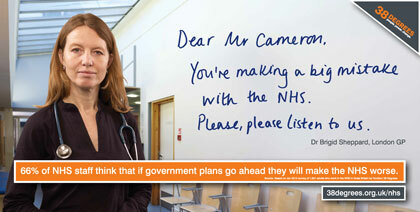 Together, we're sending a powerful message to David Cameron: it's time to call off his dangerous plans for the NHS."